View of St John’s Vale in Cumbria, Northern England. St John’s Vale links Thirlemere Lake with Blencathra and the landscape of inclines and mounds reflects its industrial past as part of the quarrying industry. The artist William Green (1760-1823), was a well known landscape painter. He was born in Manchester and showed a talent for drawing from an early age. He became a surveyor but met topographer Thomas West who encouraged him to become a professional artist. 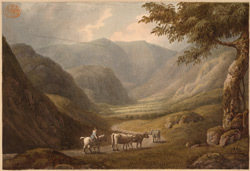 In about 1800 he moved to the Lake District where he worked on his pictures trying to create accurate representations of the spectacular landscape around him.